The history of Fenerbahçe’s basketball team dates all the way back to 1913 and the club has achieved a great deal of success in over 100 years of basketball. In 2006, the club completed a merger with Ülkerspor, forming the new team of Fenerbahçe Ülker, a decision which has been justified by the team being at the forefront of Turklish basketball since then. However in the summer of 2015, the sponsorship deal with Ülker came to an end, with the team being known as Fenerbahçe Istanbul. The club currenly plays its home games at the Fenerbahçe International Sports Complex Ülker Sports Arena which opened in January of 2012 and is a multi-purpose arena in the Ataşehir region of Istanbul. For basketball games, the arena has a capacity of 13,000. Fenerbahce were part of the Istanbul Basketball League which ran from 1927 to 1966 and won the title on 7 occasions, being the dominant team from the mid-1950s until the league disbanded. Fenerbahçe triumphed in 1954/55, 1955/56, 1956/57, 1962/63, 1963/64, 1964/65 and in 1965/66. The club also featured in the Turkish Basketball League which ran from 1946 to 1966 and they were triumphant on three occasions, in 1957, 1959 and in 1965. After this, the Turkish Basketball League started and while it took Fenerbahçe a number of years to find their feet in a highly competitive league, they have triumphed on 6 occasions. The successful seasons for Fenerbahçe have been 1990/91, 2006/07, 2007/08, 2009/10, 2010/11 and 2013/14. Fenerbahçe have also won the Turkish Cup on four occasions, triumphing in 1966/67, 2009/10, 2010/11 and in 2012/13. International success has been harder for Fenerbahçe to achieve but in the 2014/15 season, the club reached the Final Four of the Euroleague, bowing out to eventual winners Real Madrid in the semi-final matchup and then losing in the Third and Fourth placed game to CSKA Moscow. 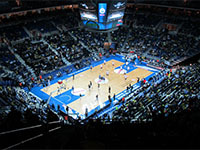 The club is a well-regarded name in the Euroleague and Turkish fans have enjoyed a number of major results from Fenerbahçe over the years. As of 2015, Fenerbahçe have played against NBA opponents on 5 occasions, three times in Turkey and twice in the United States of America. At this point, Fenerbahçe have a 2-3 record against NBA opponents. The NBA right for Bogdanović currently lie with the Phoenix Suns. In the modern Euroleague era, Fenerbahçe have had a number of players who have been highly regarded and acknowledged for their basketball skill and play. Šarūnas Jasikevičius and Željko Obradović were both included in the list of 50 Greatest Euroleague contributors while İbrahim Kutluay and Mirsad Türkcan were both nominated but just missed out on being included in the list. A major honour was bestowed on the team when Nemanja Bjelica was announced as the Euroleague MVP for the 2014/15 season. The strength of Fenerbahçe’s showing in this campaign was indicated by the fact that accolades and acknowledgment were also provided to Andrew Goudelock, selected in the All-Euroleague Second Team and Bogdan Bogdanović, who was recognised as the Euroleague Rising Star. Fenerbahçe have taken the step of retiring two numbers from their playing squad. The number 6 has been retired in honour of Mirsad Turkcan, who played for the club between 2006 and 2012 and the number 7 has been retired in honour of Omer Onan who played for the club in the 2004/05 season and then again between 2006 and 2014. Players who have served Fenerbahçe for a considerable period of time include Zeki Gülay who across two spells enjoyed 11 years at the club as did Ali Limoncuoğlu who enjoyed 11 years at Fenerbahçe between 1982 and 1993. Kemal Dinçer featured for 9 seasons between 1984 and 1993, as did Oğuz Savaş and Ömer Onan while Zaza Enden appeared for 8 seasons between 1995 and 2003.